Young shape-shifting dragon Merek is following his dream to become a knight but seems to have found an enemy in Lord Crumbles son Percy, also training to become a knight. Trying desperately to keep his dragon identity a secret, Merek finds himself locked up in a rat-infested dungeon, where his shape-shifting skill proves invaluable. But bettering young Percy may be his undoing ...? Fans of Kyle Mewburn and Donovan Bixleys popular series Dinosaur Rescue, will easily transition from dinosaurs to dragons in this new series ? 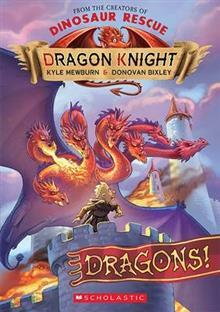 Illustrated throughout, Dragon Knight offers the perfect combination of text and pictures that young readers enjoy ? Bixleys hilarious illustrations perfectly complement Mewburns humorous text ? Utilises the trademark Mewburn/Bixley funny information panels that kids adore.